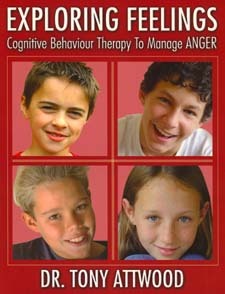 Exploring Feelings: Cognitive Behaviour Therapy to Manage Anger by Tony Attwood. Many children, especially those with developmental delays, have trouble understanding or expressing their feelings. The result can be difficulty with anger management. Listing possible responses to situations – and the likely outcome of each one – allows the child to make informed decisions about which responses to choose (walking away vs. hitting). This book provides a guide for caregivers and then the workbook portion asks children to identify situations that trigger their anger and find appropriate ways to respond. Pp. 79. This entry was posted in Interventions, Our Library and tagged Autism Spectrum Disorder, books, Tony Attwood. Bookmark the permalink.